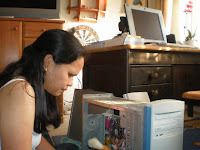 Nagbreak lang ako from work.. babu$h..
hey add mo ulit so other picture mo here.. gusto ko yun, very professional TECH hehehe.. I have done my job here.. mwah! good to hear your technique worked. my laptop has the same own mind shutting down but i know the problem is on th os vista coz no dust yet...it is only few months old kasi..
Maybe, I will clean my pc now too. My pc getting slow maybe too dusty. wow thats good. yeah sometimes we have to do it ourselves coz its expensive to let others do a simple task even. but yeah it couldbe that there's a virus in your computer. ive experienced that problem before. try installing an anti virus.